Is Ribbon Safe For My Cat To Play With? 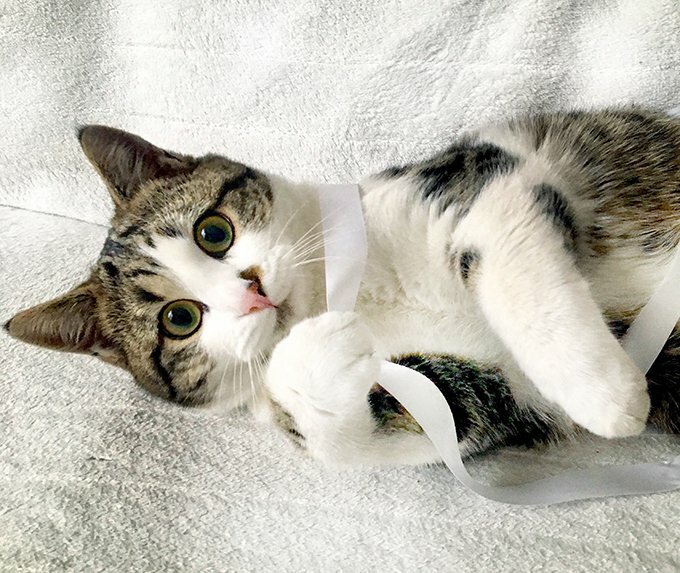 It is no secret that cats have an affinity for playing with ribbon. Anything that falls under the umbrella of ribbon-like objects, such as string, yarn, twine, tinsel, shoelaces and even rubber bands have caught many a curious cat’s eye during playtime. Playing with ribbon in a supervised scenario is considered safe. For example, if you are playing with your cat by teasing her with a ribbon at which she can playfully bat, that is a safe and fun way to play with ribbon. 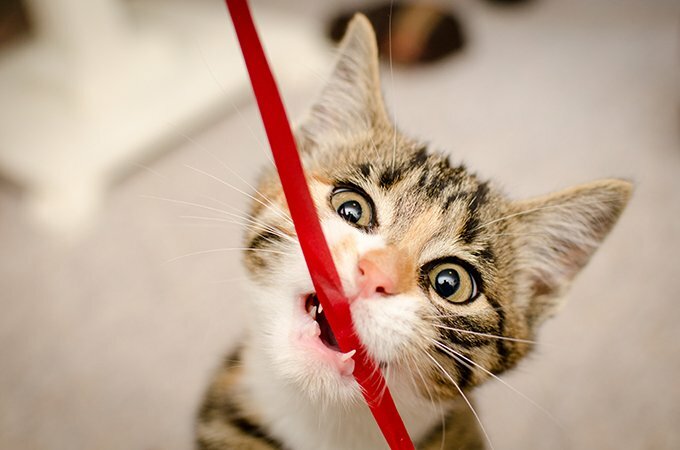 Chasing ribbon can also provide a healthy dose of exercise and mental stimulation for your kitty. If you are not directly supervising or interacting with your cat during playtime, ribbon, along with any other stringy objects or materials, is not a safe toy for your cat. While most cats will simply bat at and maybe chew on the ribbon, there are cats that opt to eat the ribbon. 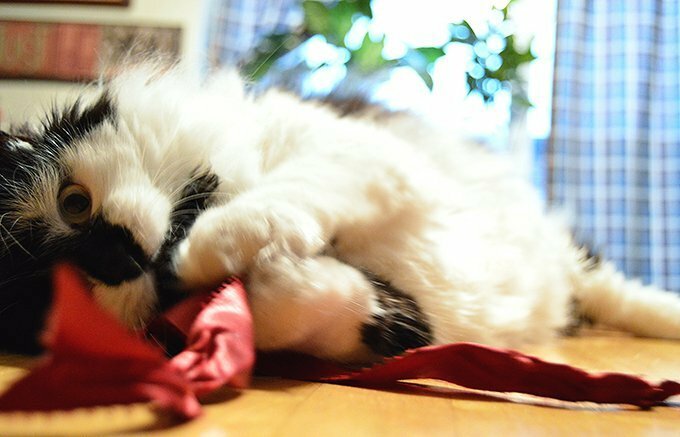 Ingesting ribbon can have potentially deadly consequences for your cat. Why Is Ribbon Dangerous For Cats? If a cat has ever licked you, you know the sandpaper-like texture a cat’s tongue. The tiny barns on a cat’s tongue are useful for a lot of things, such as grooming and consuming prey in the wild. The direction of the barbs of the tongue don’t allow a cat to spit anything out, they have to swallow. So if a cat has an end of ribbon caught on his tongue, he will have to swallow the entire ribbon. When cats eat ribbon or long, thread-like items, there are a couple of things that can happen. If the piece is small enough, your cat may pass it or vomit it back up. This is a lucky scenario for a cat who has eaten ribbon. If the ribbon or thread is long or thick, can lead to a life-threatening condition known as gastrointestinal obstruction due to linear foreign body. Linear foreign bodies develop in cats when they eat ribbon. This means one end of the ribbon is lodged somewhere in your cat’s GI tract while the rest of it is trying to get passed through. As your cat’s intestinal tract tries to move along the trapped ribbon, the intestine plicates, or bunches up. Imagine drawstring pants. If you knotted one side and pulled the other side as hard as you could, the material of the waistband would bunch up. This is what happens to your cat’s intestines with a linear foreign body. This condition can lead to a loss of blood supply to tissue in the area of the plication, causing that tissue to die. In extreme situations, the intestine can be working so hard that it rips near the plication, allowing GI waste to enter into the abdominal cavity. This can result in death if not treated. Should I Take My Cat To The Veterinarian If He Ate Ribbon? Linear foreign bodies are a surgical emergency in cats. The longer your cat has the linear foreign body lodged in his GI tract, the bigger the health risks become. Surgical procedures for removing ribbon from the GI tract is considered riskier than other foreign body removal scenarios. Prevention is key when it comes to life or death surgeries caused by ribbons or any other linear foreign bodies. Do not let your cat play with ribbon on her own. If you have any ribbon toys that you like to use to play with your cat, make sure they are securely put away whenever you are not home. Take extra precaution during holidays and celebrations so your cat doesn’t accidentally ingest tinsel or streamers. If you suspect your cat has still eaten ribbon, contact your veterinarian ASAP. Your vet may have you monitor your cat for a few hours to see if it passes naturally or they may have you come in immediately to get x-rays and determine a course of treatment. Either way, having your vet involved is the best way to make sure ribbon has not become a foreign linear body in your cat’s GI tract. Do you play with ribbon with your cat? Have you ever had to deal with a foreign linear body with your cat? Let us know in the comments.